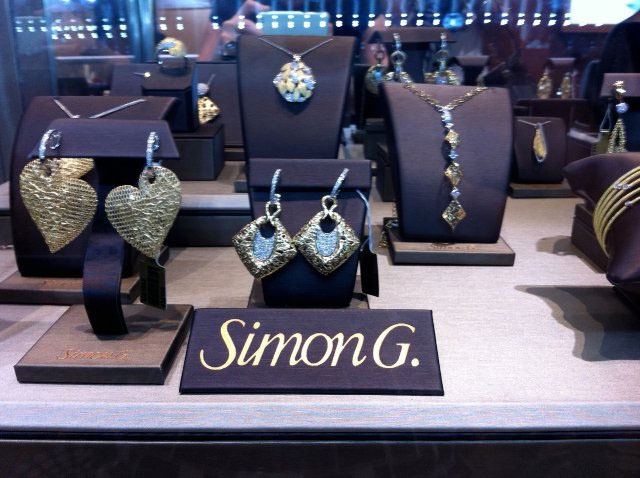 Last Saturday, Simon G Jewelry held their annual Summer Soiree at The Palazzo Las Vegas. The renowned fine jewelry artisan teamed up with fashion designer Marc Bauwer to launch their latest collection of diamond wedding bands and other jewelry pieces as well as raise awareness for Generosity Water. The event was held at Azure Luxury Pool where Multi-Platinum recording artist Gavin Rosdale gave an intimate acoustic performance on a 70-foot stage over the pool and guests enjoyed an evening of entertainment and fashion. 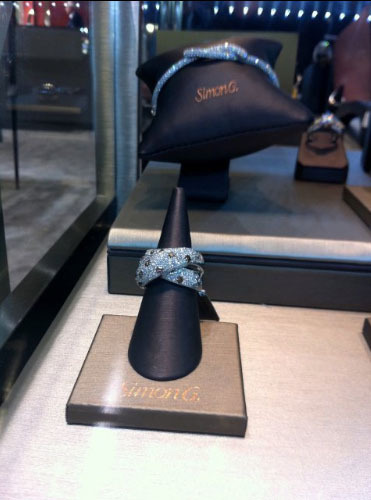 Some of the designer jewelry pieces debuted consisted of textured rings, cuffs, pendants and earrings designed from various shades of gold, diamonds and other precious stones. Celebrity guests that attended to support Simon G and the cause include America Ferrera, Terri Hatcher, Torri Spelling, Dean McDermott, Tim Urban, Jamie King, Raven Symone and Lindsey Vonn. Generosity Water helps bring clean drinking water to impoverished countries around the world. Over the last 3 decades this charity has funded over 250 wells in 17 countries and served clean water to more than 100,000 people. 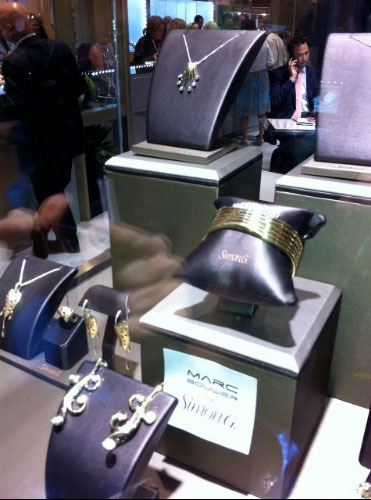 Below are a few snap shots of Simon G’s latest collection taken at the JCK Las Vegas – the jewelry industry’s biggest show of the year. Brad Pitt Flashes Wedding Band? New photos have surfaced of Brad Pitt wearing what seems to be a classic style wedding band. Cameras caught a glimpse of the sparkler on two recent occasions. The first was over the weekend when the A-list actor was out shopping with daughter Zahara for her birthday at The Grove in Hollywood, California. He was smiling and seemed to be in high spirits. The second was yesterday on the set of his new film Moneyball. Not too long ago, Brangelina gave actress Mindy Cohn, the godmother of two of their children, a huge 4-5 carat solitaire diamond ring as a thank you gift. In an October 2006 interview with Esquire Magazine, Pitt said that he and Jolie would marry when everyone in America is legally able to marry (voicing their support for gay marriage). So what are your thoughts on the ring? Did they secretly tie the knot? Is it merely symbolic? Or simply just decorative? Perhaps no other jewelry you purchase will have greater sentimental value and be worn more often than your engagement and wedding rings. As timeless symbols of your love and commitment to one another, it’s only natural that you want to take the utmost greatest care of them. 1) Protection: Be gentle to your rings – It is advised to remove your rings before potentially undertaking any heavy work, gardening or dealing with harsh chemicals. 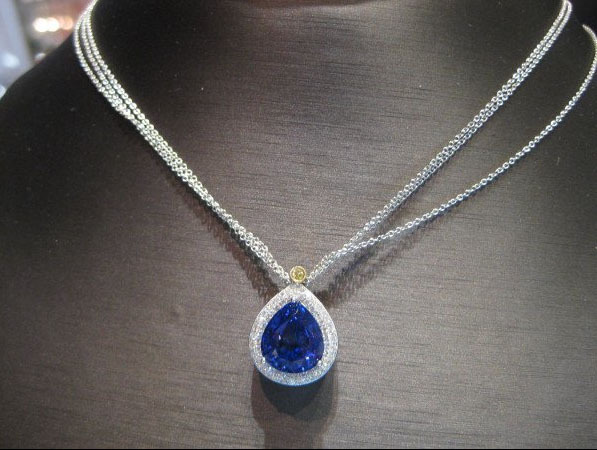 Despite being incredibly strong, gemstones and even diamonds can chip or crack if accidentally struck too hard. 2) Upkeep: Keep your rings scratch free – All precious metals will eventually get scratched over time and can be brought to any professional jeweler to be buffed and polished. 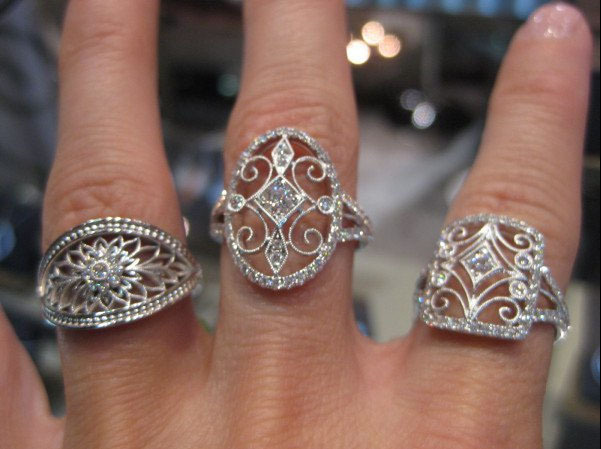 If your rings are made of white gold, your jeweler may also suggest that they be re-plated. 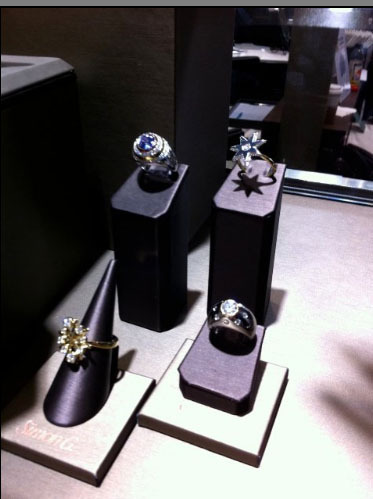 This is normal as white gold is an alloy with a yellow gold base; it gets its white color from being plated in rhodium. After being buffed, the ring may begin returning to its natural gold color. If you’ve purchased platinum wedding bands, they can be polished back to their original condition. Platinum is naturally white, so no upkeep is needed to retain its luster. 3) Inspection: Watch out for loose diamonds – For peace of mind, have your jeweler occasionally inspect her engagement ring to ensure the stones are securely in place. 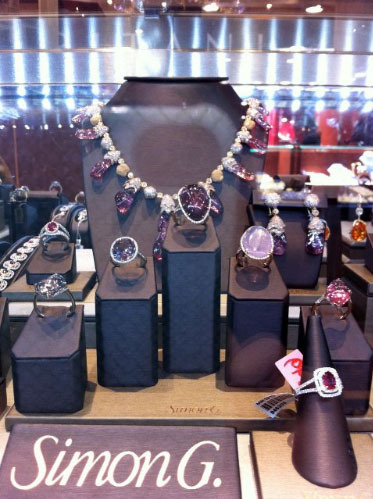 It’s not uncommon for diamonds to come loose with everyday wear and tear. We generally recommend an annual inspection. However, depending on her lifestyle and the ring’s metal type, this may need to be done more or less frequently. 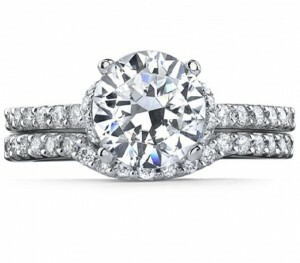 Because of its density, a platinum setting will hold stones most securely in place. 4) Cleaning: Let those diamonds sparkle – The maximum brilliance of her diamonds can be maintained by keeping the ring clean. This can easily be done by soaking the ring in a mild solution of soap and warm water or a jewelry cleaning solution and gently rubbing dry with a soft cloth. Do not do perform this near a sink as you may risk the ring falling down the drain! 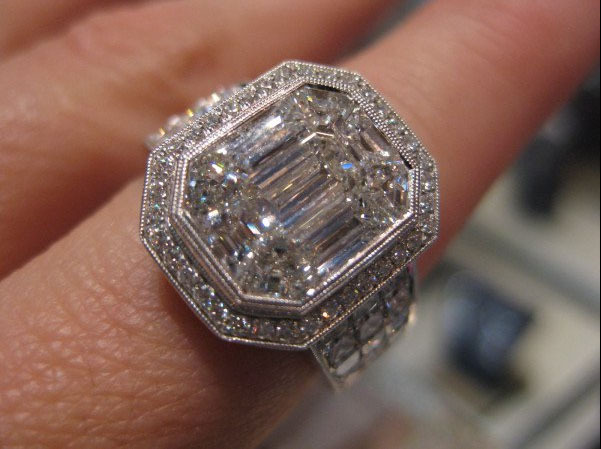 For a more thorough cleansing, take the wedding and engagement ring to your jeweler. 5) Storage: Keep your rings safe – Store your pieces in a jewelry box, individually lined compartment or chamois bag when not being worn. Ensure that they are carefully placed separately to avoid the diamonds from rubbing against other pieces of jewelery which may produce a scratch. At one point, gold wedding rings were the option. But recently platinum has grown tremendous in popularity. Platinum is more precious than gold, and has other advantages over gold as well. Platinum wedding rings are elegant. Platinum was often mixed with gold, but today you can find wedding rings of pure platinum. Polished platinum sparkles as much as gold. Platinum is a durable metal, and your active lifestyle will not get in the way of wearing a platinum ring. Given that platinum wedding rings have a very modern look, the best styles are elegant, but simple. A “comfort fit” is curved slightly in the inside, and most men find them a good choice since a ring is worn more then anything else that adorns the body. Platinum is heavier than gold which is often the main reason men choose them over gold. Remember that many men love Swiss sports watches for the same “weighty” reason. You will pay a premium for platinum. One reason some buyers go with gold is they are concerned they will lose their ring, and want to be able to replace it less expensively. Do keep in mind that an engagement ring is not like a set of car keys. You will grow to love it more and more with each passing year, as you do your partner, and will have a magnetic connection to it. That may mean that IF you take it off, you will have a brilliant system for making sure your ring is never lost. Everyone loves Hula hoops this spring!